Graduate programs in Arts, Sciences and Engineering welcome students who are actively engaged with their education and are looking for a challenging environment to expand their knowledge through further study. Our programs emphasize individualized study, which allows students to create an educational experience using Rochester’s unique facilities, nationally ranked faculty, and superb research infrastructure. 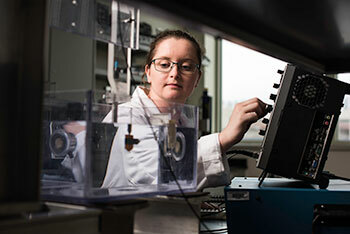 The University of Rochester offers graduate students the chance to pursue research at the highest level in an environment scaled to the individual. Graduate education is central to the mission of all schools and is an important vehicle for the missions of both research and professional preparation. We’ve highlighted several students on our student profiles page whose experiences embody the philosophy and the opportunities in their education that we offer to our graduate students. At Rochester, we believe that graduate education should comprise rigorous academic study, cutting-edge research, and relevant professional development. Whether your education takes you into academia, government, or the private sector, we have extensive resources to assist you in preparing for your career after graduation. See our City of Rochester page to learn about what our city has to offer. Please complete our inquiry form to receive additional information about graduate programs in Arts, Sciences and Engineering at the University of Rochester.